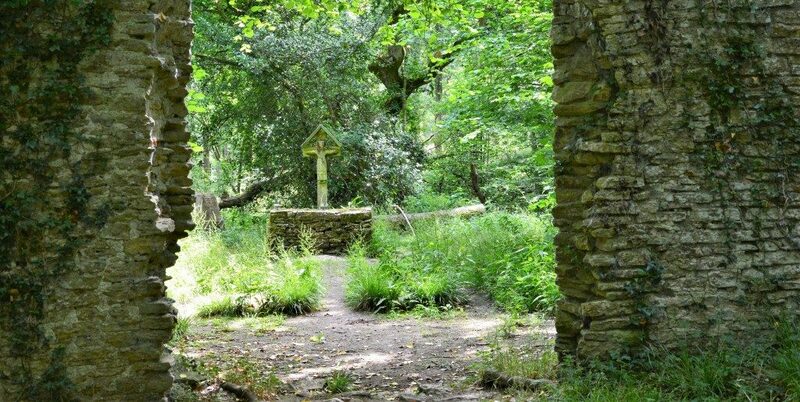 A ruinous chapel hidden in woodland with streams, birds and trees for company and only accessible by foot. 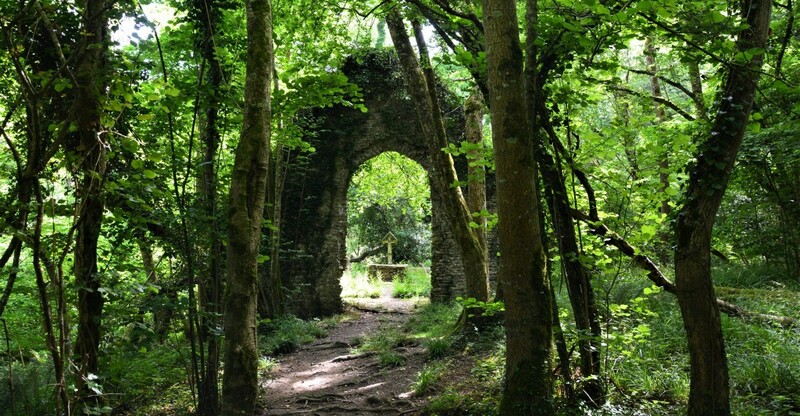 St Luke’s Chapel was built on land given to Cistercian monks from Netley Abbey by a local landowner around 1246, but after the 1500s (Dissolution) the community left and the chapel fell into obscurity and all that remains now is the western end. 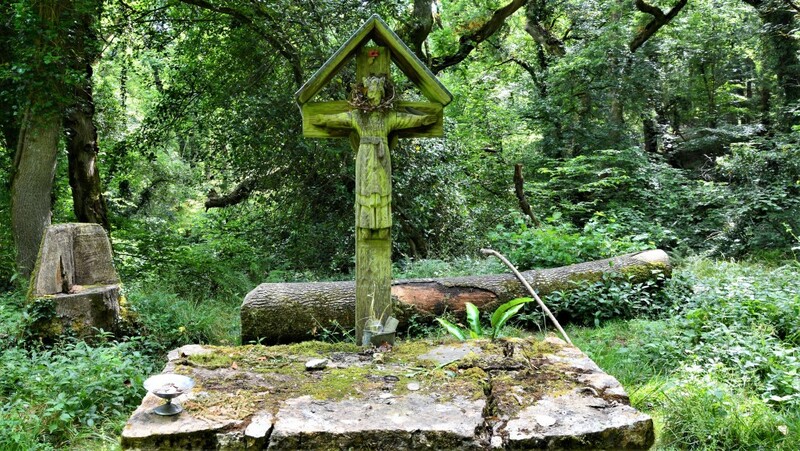 A small alter has been constructed from the debris, and a wooden crucifix resides over the graves of Sir David and Lady Olga Milne-Watson, who actually built the large house nearby in the early 1920s. They so loved the chapel that they saved what you see today and requested that their mortal remains be interred in this magical place. 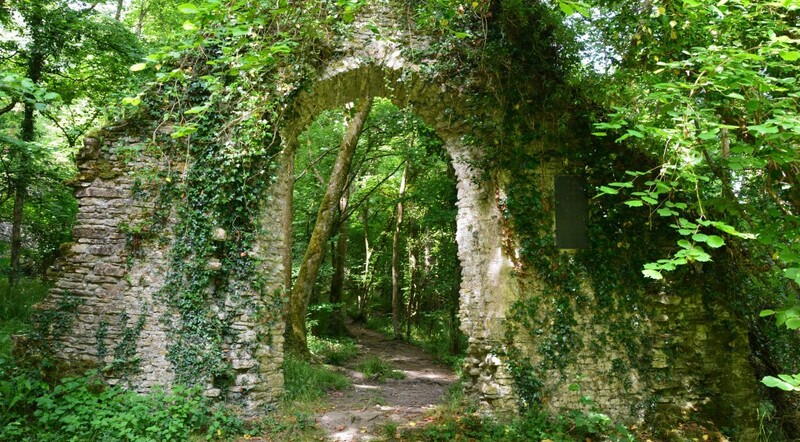 As you enter the woodland, notice the old ash trees, some of which are bent and gnarled but gently guide you on and towards the ruins. A small stream follows you as it gurgles over rocks, trying, but failing, to defy gravity. The stillness, which you will feel, is all around. The path wends its way along and crosses the accompanying stream, the trees part, and the chapel greets you. There are other things that you will notice, but I’ll leave you to find/observe them. I left the chapel ruins, returned to the track and headed back to the car. After a few paces, I was surprised to see two black and yellow striped dragonflies flying alongside me. They flew in a circle above my head and then back beside me. This was indeed strange behaviour, since, however grand, they were still insects. Then, after one more fly-past, they both settled, almost in front of me, on vegetation at the side of the track. I carefully took some photos and then realised that both of them had no intention of moving. Changing cameras, I moved in close to take a macro shot of first one then the other. When there was no movement from either, I took a few more photos. I placed the cameras back in the pack and stepped back. Both dragonflies flew up, hovered, then flew back towards the wood. Strange how your mind works at times like this, especially when thinking about the two graves back amongst the ruins. This dragonfly species, which was flying around the hills above Abbotsbury, was the Golden-ringed dragonfly – what a beauty. In such a peaceful and magical setting, the ruins have a somewhat inspiring feel. One can visit this remarkable place and just be there. 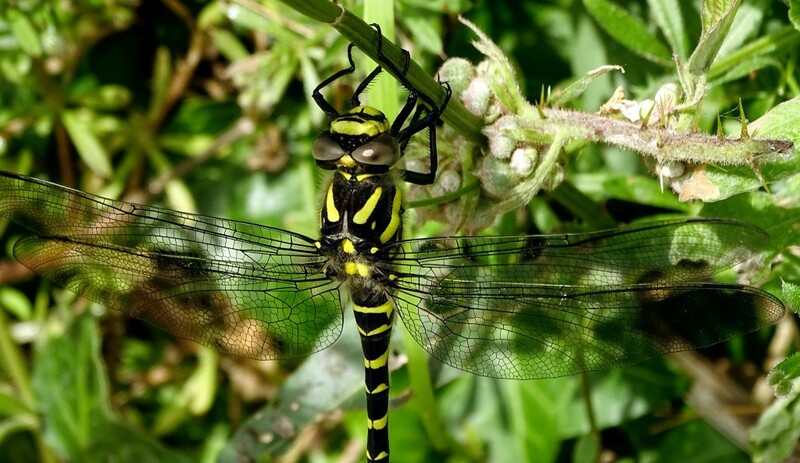 A golden-ringed dragonfly photographed by Peter Norton during the visit described. From Abbotsbury, take the B3157 westward for about 1½ miles, which leads up a steep hill. Towards the top, there is a very minor road (you come upon it rather suddenly) to the right. Take this for about ½ mile. You will come to a fork in the road with a grass verge in the middle: leave your car here. (1) Take the left fork and follow the track for about a mile. (2) After about a mile, there is a gate on your right leading into the wood, with a path beyond. This leads directly to the ruin. (3) The path wends its way though the woods and has some bridges that cross a meandering stream. The carpet of bluebells stretch right through the woods towards the chapel. The chapel is well hidden by the trees and will appear directly in front of you after about 300 yards. The ‘Chapel in the Woods’ dates from around 1245 and was an abbey inhabited by a few monks. After the Dissolution, the community was abandoned and then faded into obscurity until new owners bought property nearby – Sir David and Lady Olga Milne-Watson, who fell in love with the ruined chapel. They employed workmen to conserve what remained of the ruin and added an altar and cross to the site. Both the Milne-Watsons are buried here and the occasional wedding blessing or baptism still takes place at this peaceful spot. This remains a consecrated church.